PROJECT FULLY FUNDED IN 2017-2018 STATE BUDGET! This show describes facilities and activities at the park, many of which would be lost if the park were closed even temporarily. Also, it is a good place for new visitors to become familiar with the park's most important features and how they got there. We can all take a minute to congratulate ourselves on this wonderful community wide effort to attain the funding necessary to begin restoration and to reopen this historic icon. We can savor how, working together, we accomplished this first major step to Save Our Bridge. Please see Campaign Updates column. With restoration funding in place, we need to make sure that the project is continued to be identified and treated as a priority for the California Department of Parks and Recreation (DPR). The restoration work is scheduled to begin in the late Spring or early Summer of 2018. Construction work can begin as soon as the river water level drops enough to be determined safe to work. This historic Bridge is in a weakened condition. There is real urgency to begin the restoration project as soon as is possible. We, as a community, need to work closely with DPR to monitor the progress of the project and make sure the repairs and restoration work is completed in a timely manner. We need you to stay involved and informed. Let DPR know that you want this project to be completed as soon as is possible. Check this website frequently for updates, and respond to future “Action Alerts”, as we may need to communicate our positions on issues during the restoration process with State Representatives and DPR. Donate to the Campaign – We still need funds to run the campaign. More importantly we are saving the bulk of donated funds to have the ability to contribute, at the end of the project, should there be any monetary shortfall to complete the restoration. All donated money will be used in the campaign or go directly to the Bridge. Historic Covered Bridge Construction to Begin April 30, 2019! To see bridge photos about restoration progress, click the link below. Recently, the CBS and NBC Television Affiliates from Sacramento traveled out to Bridgeport to talk with Matt Green and Doug Moon about our beloved covered bridge and its eminent and full restoration scheduled for 2018...In case you didn't catch it on the news, the following two links will take you to the stories. Thanks to Governor Brown, State Legislators, and Department of Parks and Recreation (DPR), the funding to save the longest, single span wood covered bridge left in the world is assured. DPR reports there is $4.128m in the approved 2017-2018 budget allocated for the renovation of this historical treasure. On Tuesday, January 10, 2017, California Governor Edmond G. Brown released the proposed 2017-18 State Budget which included an allocation of $3,226,000 for the construction costs for restoration of the Bridgeport Bridge in Nevada County. Specifically, the funds are being allocated through the Department of Parks and Recreation’s State Building Program Expenditures. This achievement was due to advocacy work by the Save Our Bridge Campaign Committee (S.O.B. 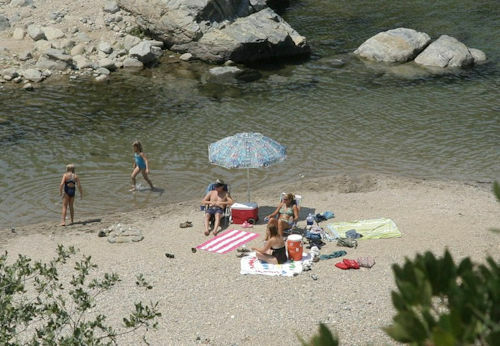 ), the South Yuba River Citizens League (SYRCL) and District IV Supervisor, Hank Weston. RENOVATION OF THE BRIDGE BEGINS!